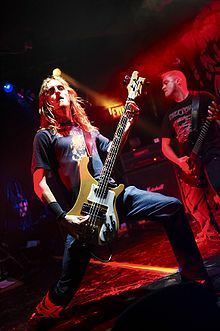 * Sam Dunn is an award-winning documentary filmmaker, Canadian musician, and anthropologist best known for his series of documentaries on heavy metal music. He co-owns Toronto-based production company Banger Films with Scot McFadyen. Dunn holds a bachelor's degree in anthropology from the University of Victoria and a master's degree from York University where his thesis work focused on Guatemalan refugees. Dunn's first documentary film, Metal: A Headbanger's Journey, won a Gemini Award for Best Writing in a Documentary. His additional credits include the Grammy-nominated Rush: Beyond the Lighted Stage and Super Duper Alice Cooper, winner of Best Feature-Length Documentary at the Canadian Screen Awards. Dunn co-directed and hosted the biggest-ever TV series on the history of heavy metal, Metal Evolution, which reached #1 on VH1 Classic (USA) and M3 (Canada), and most-recently co-directed the Netflix original series Hip-Hop Evolution which has been awarded a Peabody, an International Emmy, and a Canadian Screen Award. *Biography from Wikipedia.